Elnur Connected is the new smart way to control your heating - with the world's first range of multiple electric heating appliances controllable from a single app using a smartphone or tablet. Which appliances does the Elnur Connected include? If an appliance is in the new Elnur Connected range then they are each supplied with a built in receiver. Elnur Connected Gateway - The Elnur Connected range is designed to provide the optimum internal wireless signal strength and enable base operation even if the broadband service within the property is offline. The Elnur Gateway is the heart of every system creating the strong internal WiFi network in conjunction with room/zone thermostats and appliance receivers. The Elnur Gateway is directly connected to your home broadband router to ensure the very best connection to your broadband. Elnur Connected Wireless Thermostat / Zone Thermostat - Both of the Elnur wireless thermostat and the zone thermostat pair directly to the heater receiver and provides a home user interface offering occupants wireless central control. When paired with the gateway and operational the user is able to easily set up and adjust programming for both time and temperature from anywhere simply by using the 'App' from a smartphone or tablet. When used without the Gateway a wireless control system without internet access is provided. The Elnur G Control app, allows you to access and control your heating system from anywhere and at any time, with an internet connection available from Google play or App Store. The system has been integrated in the technology of the entire range of Elnur Connected electric radiators, offering maximum comfort and management of the heating, by controlling the temperature in your home and your electricity consumption at real time. The app will only work with Elnur Connected and the gateway 'G Control Hub'. Control of electric radiators with an easy and intuitive handling by providing quick access to all information and programming of radiators. 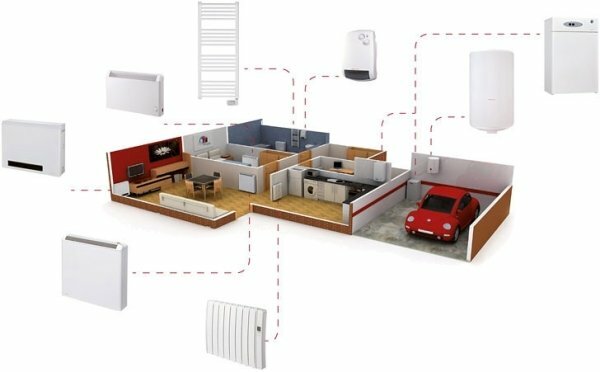 Switch on, modify or switch off the heating from anywhere in the world and manage the heating in real time. Turn on, turn off, modify the programming or change the set temperatures or the operating mode of the radiators. It is possible to add up to 31 radiators per 'G Control hub' and link lots of 'G Control hubs' to the same account. In addition, the application allows you to register more than one property, connecting your own electric radiators to rooms in each of the properties, with their own programming and temperature setpoints. Control of second homes associating their own radiators per rooms, for each of the houses, with their own programming and setpoint temperatures. Install and associate a power meter. Rationalising electricity consumption makes guaranteed savings. Access to electricity consumption history per days, weeks and years. Comfort and programming are always at your fingertips allowing you to modify, switch radiators on or off independently and programme each radiator daily and weekly that will allow you to determine the exact temperature setpoint 24 hours a day, seven days a week. Elnur Connected radiators incorporate three operating modes and the three standard temperature levels; Comfort, Economy and Frost Protection, which you are able to assign their own temperatures.